Outside Sales Rep is responsible for promoting, marketing, selling and maintaining profitably of the products and services of the company. 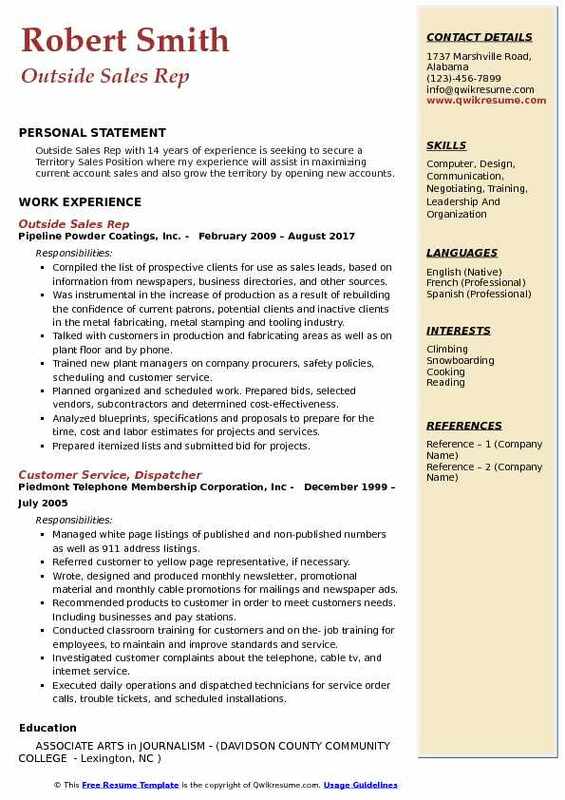 Even though the job title may differ, the job description template remains the same for these professionals and includes tasks like making personal sales by visiting client’s location, seeking prospective customers or business, staying abreast with existing product and technologies, introducing and demonstrating new products at assigned place, generating quotations and cooperating with qualified suppliers. 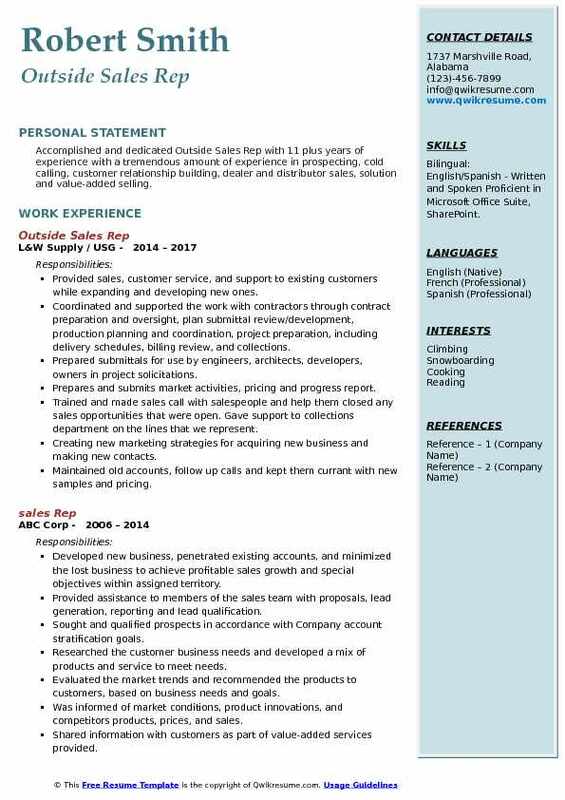 The qualifications and educational requirements that should be highlighted on the Outside Sales Rep Resume should include- demonstrable knowledge of time management and organizational skills, a thorough knowledge of the industry and the product that is being sold, valid driving license, the ability to analyze and understand business periodicals, technical procedures and professional journals; and flexibility to travel as per requirements. 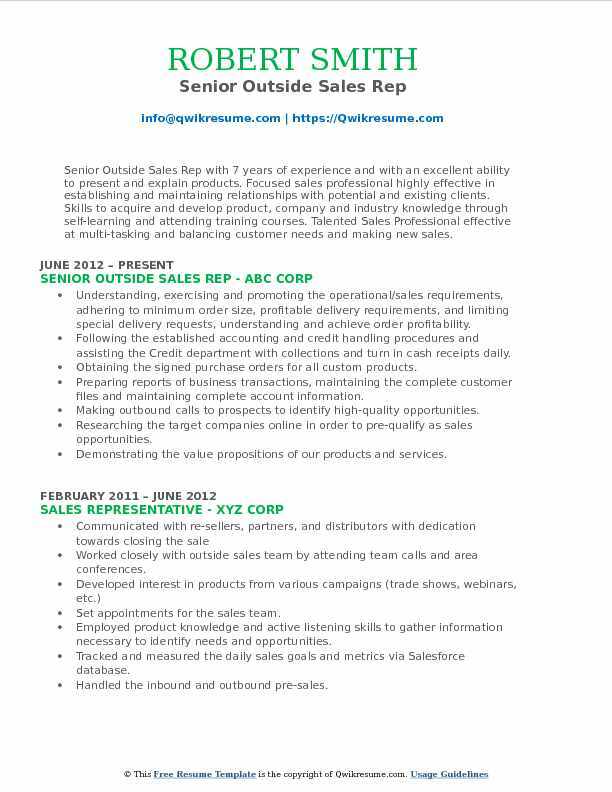 A bachelor’s degree in sales or any closely related field is the minimum expectation for this role. 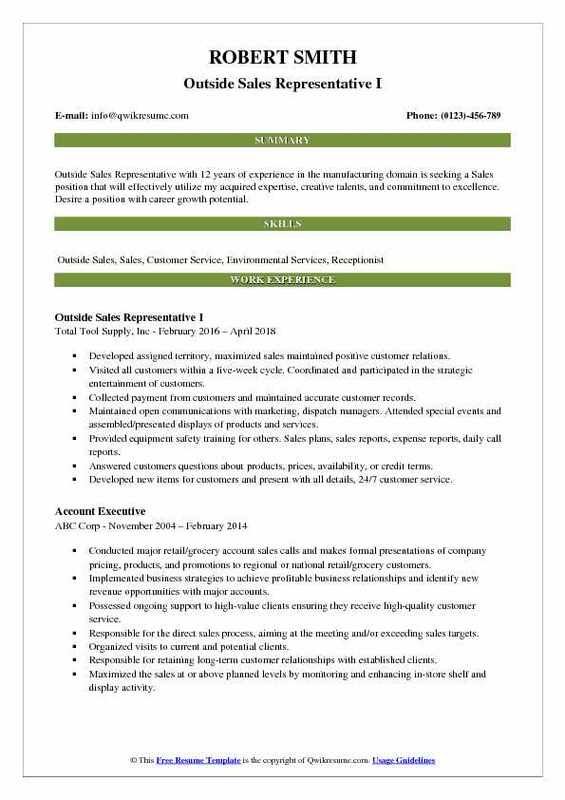 Summary : Outside Sales Rep II with 15 years of experience is seeking a position in the field of supply chain/procurement. Willing to and able to perform in all capacities within the supply chain business. Serviced existing accounts while obtaining orders and establishing new accounts by planning and organizing daily work schedule to call on existing or potential sales outlets and other trade factors. Monitored the competition by gathering current marketplace information on pricing, new products, delivery schedules, merchandising techniques etc. Resolved customer complaints by investigating problems, preparing reports, making recommendations to management. Contributed to team effort by accomplishing related results as needed. Provided excellent customer service. Visited the establishments to evaluate needs or to promote product or service sales. Prepared the sales contracts for orders obtained, and submitted the orders for processing. Create business culture fostering referrals, leads, follow-up and repeat sales; introduce new products and special promotions; address and resolve concerns quickly or escalate as needed. Summary : Highly self-motivated, accomplished Outside Sales Representative IV with 22 years of experience and with strong customer-focus people skills. Excellent in building relationships, communication, listening and building a solid team environment. Strong organizational and presentation skills allow for successful engagements with clients. 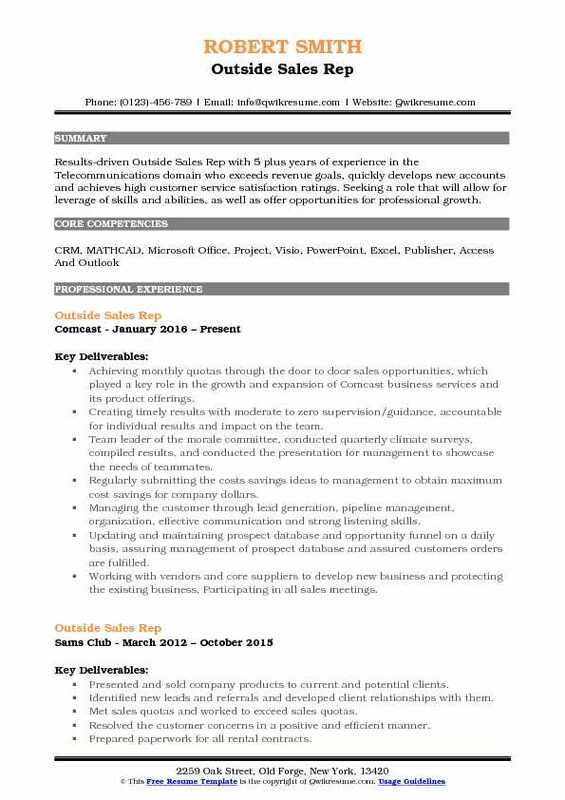 Skills : Technological Set: CRM Salesforce, Excel, PowerPoint, And Microsoft Word. Managed Northern California and Western Nevada territory, developed new customers and raised the commitment with architects and interior designers to grow sales. Conducted product knowledge training to facilitate the proper representation and sale of sub-zero and wolf appliances. Increased the territory results by building and maintaining strong business relationships, and by implementing sales strategies. Searched for and developing new business throughout Northern CA and Western Nevada. Presented all marketing and advertising promotions while providing recommendations and assistance to build the sub-zero and wolf brand. Developed new accounts as well as servicing existing accounts. Took orders from customer and worked with planning and scheduling to set up jobs for the customers can make their deadlines. Worked with customers and management on pricing to make sure that both parties were satisfied. Summary : Outside Sales Representative with 12 years of experience in the manufacturing domain is seeking a Sales position that will effectively utilize my acquired expertise, creative talents, and commitment to excellence. Desire a position with career growth potential. Developed assigned territory, maximized sales maintained positive customer relations. Visited all customers within a five-week cycle. Coordinated and participated in the strategic entertainment of customers. Collected payment from customers and maintained accurate customer records. Maintained open communications with marketing, dispatch managers. Attended special events and assembled/presented displays of products and services. Provided equipment safety training for others. Sales plans, sales reports, expense reports, daily call reports. Answered customers questions about products, prices, availability, or credit terms. Developed new items for customers and present with all details, 24/7 customer service. Provided customers with expert advice on equipment selection, operation, and maintenance. Answered the customer calls, resolved issues and concerns, ensuring repeat business. 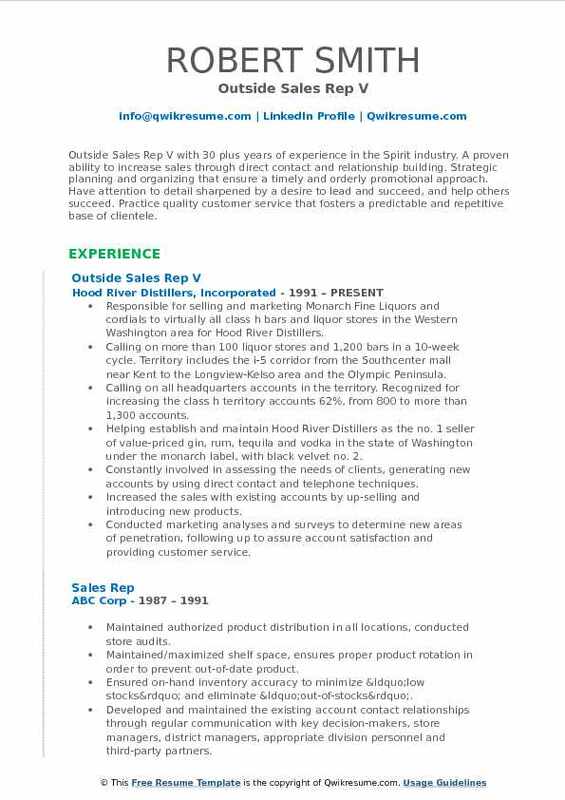 Summary : Outside Sales Rep V with 30 plus years of experience in the Spirit industry. A proven ability to increase sales through direct contact and relationship building. Strategic planning and organizing that ensure a timely and orderly promotional approach. Have attention to detail sharpened by a desire to lead and succeed, and help others succeed. Practice quality customer service that fosters a predictable and repetitive base of clientele. Responsible for selling and marketing Monarch Fine Liquors and cordials to virtually all class h bars and liquor stores in the Western Washington area for Hood River Distillers. Calling on more than 100 liquor stores and 1,200 bars in a 10-week cycle. Territory includes the i-5 corridor from the Southcenter mall near Kent to the Longview-Kelso area and the Olympic Peninsula. Calling on all headquarters accounts in the territory. Recognized for increasing the class h territory accounts 62%, from 800 to more than 1,300 accounts. Helping establish and maintain Hood River Distillers as the no. 1 seller of value-priced gin, rum, tequila and vodka in the state of Washington under the monarch label, with black velvet no. 2. Constantly involved in assessing the needs of clients, generating new accounts by using direct contact and telephone techniques. Increased the sales with existing accounts by up-selling and introducing new products. Conducted marketing analyses and surveys to determine new areas of penetration, following up to assure account satisfaction and providing customer service. 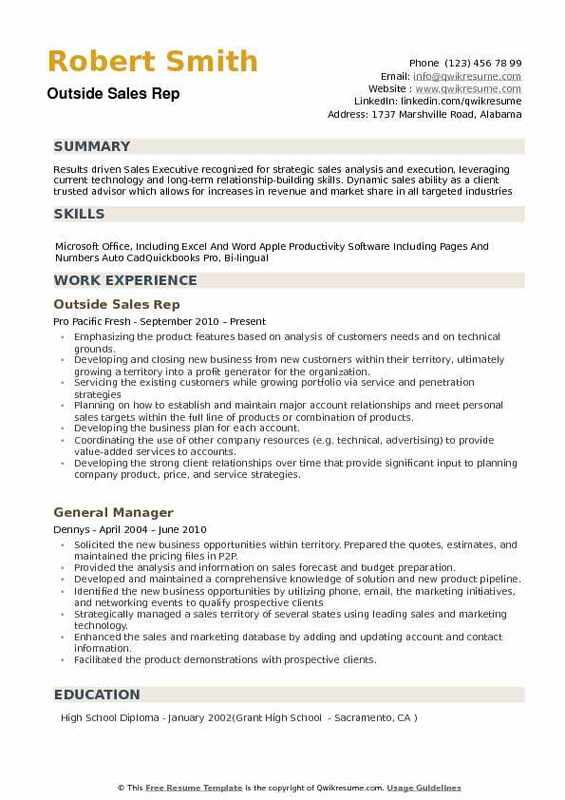 Summary : Accomplished and dedicated Outside Sales Rep with 11 plus years of experience with a tremendous amount of experience in prospecting, cold calling, customer relationship building, dealer and distributor sales, solution and value-added selling. Skills : Bilingual: English/Spanish - Written and Spoken Proficient in Microsoft Office Suite, SharePoint. Provided sales, customer service, and support to existing customers while expanding and developing new ones. Coordinated and supported the work with contractors through contract preparation and oversight, plan submittal review/development, production planning and coordination, project preparation, including delivery schedules, billing review, and collections. Prepared submittals for use by engineers, architects, developers, owners in project solicitations. Prepares and submits market activities, pricing and progress report. Trained and made sales call with salespeople and help them closed any sales opportunities that were open. Gave support to collections department on the lines that we represent. Creating new marketing strategies for acquiring new business and making new contacts. Maintained old accounts, follow up calls and kept them currant with new samples and pricing. Summary : Outside Sales Rep II with 14 years of experience is seeking an Outside Sales Rep position with a vibrant company where I can use my solid sales experience and proven customer-relationship strengths to achieve challenging sales goals. Worked with contractors over the phone to provide them with a customizable service that will help grow their business. Setting correct expectations and guidelines so the client can be successful. For approved members, customer service is provided to ensure our service is working to best fit their company's needs. Provided individual attention and customizing pitch for each individual to meet the needs required to be successful. Set appointments and followed up with contractors in a timely manner. Acquired new accounts through referrals, consistent cold calling, and effective sales presentations. Maintained current customer base through weekly route communication and continual new product demonstrations. Attended the various manufacturers' schools, seminars and webinars to increase product knowledge and maintain growth. Wrote designed and produced sales literature, marketing and promo materials, quote sheets, company introduction letters, photo portfolios and special events notices. As well as planned, organized and set up booths at trade events and industry shows. 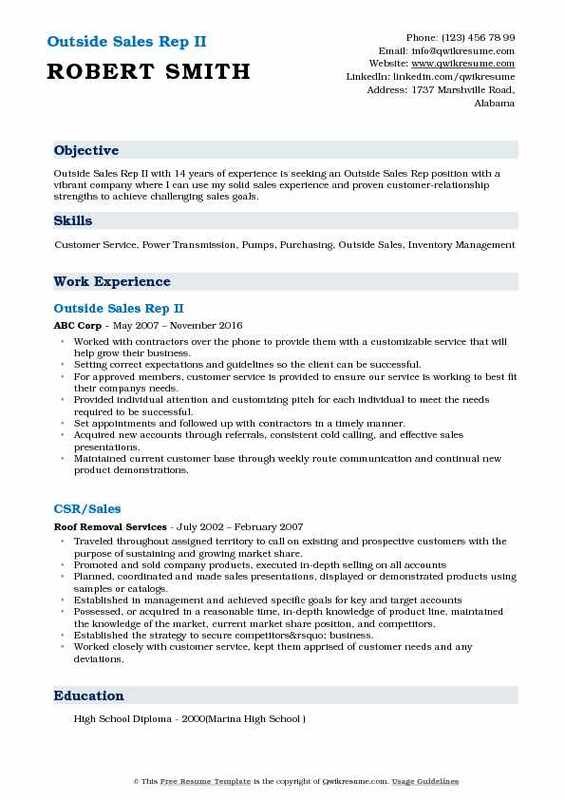 Summary : Senior Outside Sales Rep with 7 years of experience and with an excellent ability to present and explain products. Focused sales professional highly effective in establishing and maintaining relationships with potential and existing clients. Skills to acquire and develop product, company and industry knowledge through self-learning and attending training courses. Talented Sales Professional effective at multi-tasking and balancing customer needs and making new sales. Understanding, exercising and promoting the operational/sales requirements, adhering to minimum order size, profitable delivery requirements, and limiting special delivery requests, understanding and achieve order profitability. Following the established accounting and credit handling procedures and assisting the Credit department with collections and turn in cash receipts daily. Obtaining the signed purchase orders for all custom products. Preparing reports of business transactions, maintaining the complete customer files and maintaining complete account information. Making outbound calls to prospects to identify high-quality opportunities. Researching the target companies online in order to pre-qualify as sales opportunities. Demonstrating the value propositions of our products and services. 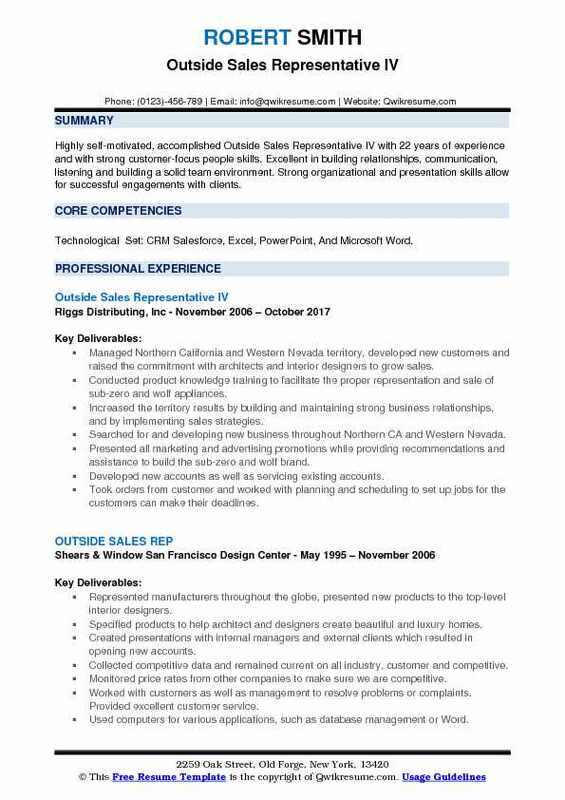 Managing a high volume of leads in Salesforce.com to accurately and efficiently build the pipeline. Headline : Results-driven Outside Sales Rep with 5 plus years of experience in the Telecommunications domain who exceeds revenue goals, quickly develops new accounts and achieves high customer service satisfaction ratings. Seeking a role that will allow for leverage of skills and abilities, as well as offer opportunities for professional growth. Achieving monthly quotas through the door to door sales opportunities, which played a key role in the growth and expansion of Comcast business services and its product offerings. Creating timely results with moderate to zero supervision/guidance, accountable for individual results and impact on the team. Team leader of the morale committee, conducted quarterly climate surveys, compiled results, and conducted the presentation for management to showcase the needs of teammates. Regularly submitting the costs savings ideas to management to obtain maximum cost savings for company dollars. Managing the customer through lead generation, pipeline management, organization, effective communication and strong listening skills. Updating and maintaining prospect database and opportunity funnel on a daily basis, assuring management of prospect database and assured customers orders are fulfilled. Working with vendors and core suppliers to develop new business and protecting the existing business. Participating in all sales meetings. 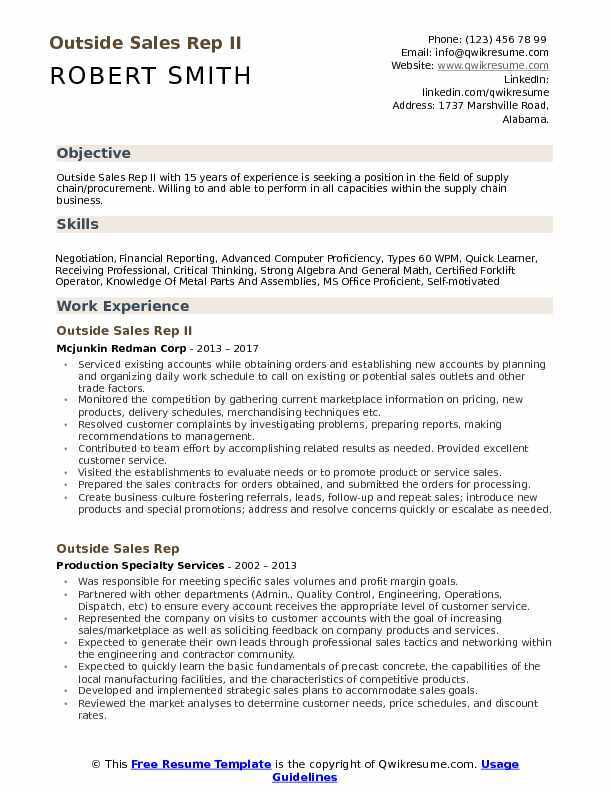 Summary : Outside Sales Rep with 14 years of experience is seeking to secure a Territory Sales Position where my experience will assist in maximizing current account sales and also grow the territory by opening new accounts. Compiled the list of prospective clients for use as sales leads, based on information from newspapers, business directories, and other sources. Was instrumental in the increase of production as a result of rebuilding the confidence of current patrons, potential clients and inactive clients in the metal fabricating, metal stamping and tooling industry. Talked with customers in production and fabricating areas as well as on plant floor and by phone. Trained new plant managers on company procurers, safety policies, scheduling and customer service. Planned organized and scheduled work. Prepared bids, selected vendors, subcontractors and determined cost-effectiveness. Analyzed blueprints, specifications and proposals to prepare for the time, cost and labor estimates for projects and services. Prepared itemized lists and submitted bid for projects. Assertively planned and executed the sales program in the territory. Acted proactively to create opportunities for new business. Emphasizing the product features based on analysis of customers needs and on technical grounds. Developing and closing new business from new customers within their territory, ultimately growing a territory into a profit generator for the organization. Planning on how to establish and maintain major account relationships and meet personal sales targets within the full line of products or combination of products. Developing the business plan for each account. Coordinating the use of other company resources (e.g. technical, advertising) to provide value-added services to accounts. Developing the strong client relationships over time that provide significant input to planning company product, price, and service strategies. Supporting the supervisor and other sales professionals in developing new market opportunities in the designated territory or market.